I was showing it to a policeman friend a few months ago and he was agog at the age and how good of shape it is in. So, I decided that it would be cool to somehow display the gun in my house. Thus began the idea for decorating the guest room. I've got several photos from my granddaddy of his dad and friends with their guns - even one on a hunting trip (which I can't seem to find to post right now - update: thanks Mom for sending me the picture!!). My great-grandfather is center back in the first photo, and far left in the second - and I'm not exactly sure which one he is in the last photo. Busy, busy weekend. Wait, let me back up. Busy, busy last week. Monthly staff / board meetings at work, plus babysitting auditors, trying to help them learn our business --- kinda difficult when they have a hard time asking a question. Quite frustrating, actually. I get the distinct impression that because they don't understand what I do, they assume that I am trying to hide something or lie to them. Maybe that is a little harsh, but it is the feeling from across the desk. I'm so hoping they wrap up this week on schedule and are out of my hair. Yesterday I headed out to Forney to a strip of antique/junk stores along Hwy 80 hoping to find some recycled white picket fence for a headboard for my guest bed. Had called my sis and bro-in-law to see if I found something if one of their vehicles might be free to help me cart it home and they decided to come along. It was fun to just wander and hang out for a few hours. Came home after a trip to Blockbuster and watched movies all night. Saw The Departed and Come Early Morning. Two very different movies. The Departed was very harsh, but intriguing. And I love all the actors, so somehow it made the blood, guts and language easier to bear. Come Early Morning just looked interesting - I hadn't heard anything about it. Wouldn't necessarily recommend it, but it wasn't horrible. Today after church, I headed to Home Depot. Since I hadn't found the fence in a recycled format, I decided to just build it. Getting kinda anxious to finish up this room and I'm tired of looking. So, bought pickets and braces - had them cut to size and came home to construct the headboard. Didn't take very long, thankfully. Now, I just need to paint it and I'm done! I saw reference to this at Karen's site. Intriguing. The problem is, I don't know what I want to read! Now that I am riding the train every day, I'm flying through books. (Seriously, I read Angels and Demons in 2.5 days - just in 25 minutes each way on the train and at lunch.) 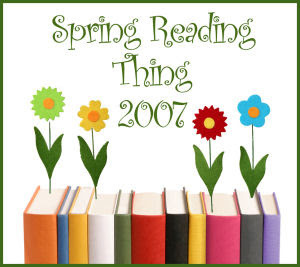 Just for kicks, I'm gonna try to document all the books I read in 2007. I'm not sure I can remember everything I've read so far this spring, but we'll take what we can get and go from here. Any book suggestions that you want to make would be welcomed. I enjoy fiction with a romantic or mysterious turn. Don't go for much that is really deep - I read (like I watch movies) to escape reality. And yes, I have a library card, so I should be able to get anything I want. Here's the list so far for 2007 -- I'll keep a word doc and update you all periodically with a grand total recap at year end. Whew.....another Saturday come and gone....and I'm beat....and SORE! Who knew owning a home would be so much work?! I got up this morning after sleeping in until about 9:00, courtesy of my wonderful eyeshades! (my bedroom is the sunniest room in the house....ugh). I got dressed to work outside, even though I had NO desire to do so. I've just learned that is one task you really shouldn't procrastinate. I spent a couple of hours pulling stuff out of my gutter grates that fell from the oak tree as it blossomed, raking dried out balls from my sweet gum tree that covered the front yard, trying to pull out dead stuff that I'd killed with Roundup, and last but not least, mowing. I don't think yard work will ever be something I look forward to, but it wasn't too bad today (except for the soreness factor). Of course, it was at most in the 60s this morning.....come summer when it is at least 80 overnight, no amount of yard work will be fun. I also met another neighbor .... from across the street this time .... she was out working in her yard too, and came across to say hello. Of course, I can't remember her name now! But at least we've met. After I got cleaned up, I went and bought a mattress for my guest room bed. As soon as I get sheets, the official guest room will be open for business. And for the first time in about 5 years, my parents will be able to sleep in the same bed when they come for a visit, as opposed to the twin trundle bed they sleep on now. Hopefully, they'll like the mattress I picked out. Ran a few more errands, then came home to wait for the delivery guys. Unloaded the dishwasher, unpacked a few more boxes, including the contents of my sewing machine cabinet, remembered how to attach the sewing machine to the cabinet, watched a little TV, and now I'm off to bed! My old cell phone was dying.....so I got a new one today......isn't it pretty?? I'm looking forward to playing with all the new stuff I can do!! About 14% of all people have your personality, including 9% of all women and 17% of all menYou are Introverted, Sensing, Thinking, and Judging. Fun, comforting, and friendly.You are a true classic, and while you're not super cutting edge, you're high quality.People love your company - and have even been known to get addicted to you. I woke up with the sunlight about 7:00 this morning - but stayed in bed until about 8:00. Got up - ate a banana and then headed outside. I spent about two hours outside - raking leaves (it would probably have been 3 or 4 big bags full) and mowing/mulching the leaves with the grass and weeds. Filled the bird bath and trimmed some plants. My body is hurting now - will probably hurt more tomorrow - but it is a good feeling to have that done. And now I officially have yard shoes - my tennies were SO dirty when I got done. I've gotta go buy a new pair now! Came in and talked with my friend Kelly for about an hour on the phone. We've seen each other several times this week, but didn't have focused time just the two of us to talk and really catch up. I ate a quick PB&J sandwich, then cleaned up and ran errands. After I got home, I decided it was time to hang some things on the walls - so my chiming clock is up, as are three new thimble cases. I unpacked all my thimbles and got them situated also. Feels so good to be getting even closer to being settled!! Now, I'm gonna sit and watch a little TV before crawling back into my bed. Last night I got to host a three-way birthday celebration in my home. Sarah's bday was Feb 25, and Katie's was Feb 27. When we were in college we would often share one big party for the three of us -- and we were able to resurrect that tradition last night. It was a simple meal, but so fun to each invite a couple of friends and see those worlds mesh around the table. We told stories and talked and laughed for several hours. So fun. Thanks girls for having birthdays and agreeing to celebrate us all together! Hope you all have a great first day of March! !